This is a highly recommended H2H style basic cardigans and top tee, comfortable, soft skin friendly, and relaxed silhouette. * Textured material makes this scarf luxuriously warm and stylish. In a classic design and cut. * Perfect fashionable cardigan wrap to pair with your favorite shorts, skinny jeans, or leggings for a casual everyday look; Great gift idea for yourself or your friends & family. * Occasion: casual outtings, school, office, dates, and parties any occasion is perfect. * This is especially designed to give you a confidence that will make you feel special and comfortable. US Small - 38" / 17.5" / 22.5" / 31.5"
US Medium - 40" / 18" / 23" / 32"
US Large - 42" / 18.5" / 23.5" / 32.5"
US X-Large - 45" / 19.25" / 24" / 33"
US 2X-Large - 48" / 20" / 24.5" / 33.5"
US 3X-Large - 51" / 20.75" / 25" / 34"
US Small (Asia S)----Chest 37.5"---Shoulder 37.5"---Length 29.5"
US Medium (Asia M)---Chest 39"---Shoulder 39"---Length 31.5"
US Large (Asia L)---Chest 42"---Shoulder 42"---Length 35.5"
US Small - 48" / 21.5" / 18.5" / 30"
US Medium - 49" / 22" / 19.5" / 31"
US Large - 20" / 22.5" / 19.5" / 31.5"
Soft & Heavy Materials, Relaxed fit falls naturally over the body. 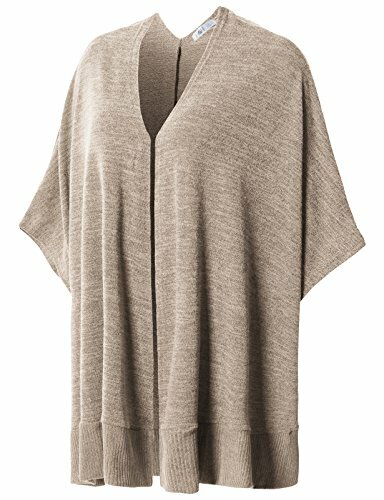 Faux cashmere, open front, extremely soft, warm ad cozy poncho cardigan is perfect for any informal occasions or daily life. And The painted design will reveal your unique glamour and the original tailoring will show your elegance.